Home » Appetizers » Some Bunnies Bring A Fresh Take To Easter Brunch! Everybunny needs a little extra help and a fresh take in the kitchen when it comes to getting ready for family holiday gatherings, like Easter. 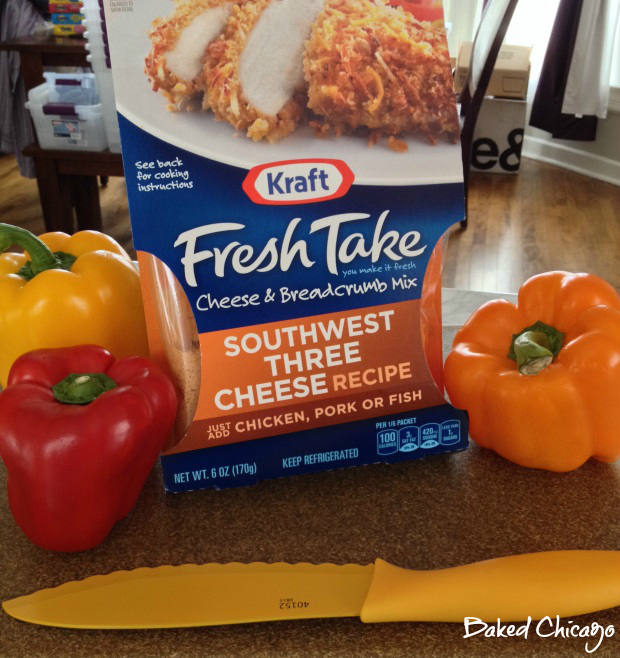 So I accepted a challenge to use three varieties of KRAFT #FreshTake Cheese & Breadcrumb mixes to create side dishes for Easter brunch on this #shop for #Collective Bias. 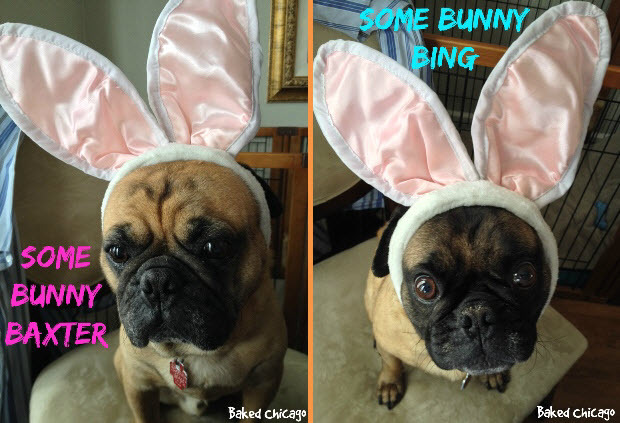 But I knew I had to get some help from some bunnies (actually, they’re apricot-fawn pugs) named Baxter and Bing. They are rescues and the MOST FOOD OBSESSED DOGS my vet and dog trainer have ever seen! That’s probably why the universe put us together. Their help in deciding on what to make for an Easter brunch menu is (almost) always invaluable. Now Baxter and Bing don’t actually help prep any food (I thought I should call that out, as I’ve been told I’m somewhat obsessive when it comes to my dogs). But Bing (the father) and Baxter (the son) may occasionally taste test an ingredient as I cook. So it was off to my local Walmart to get the ingredients. 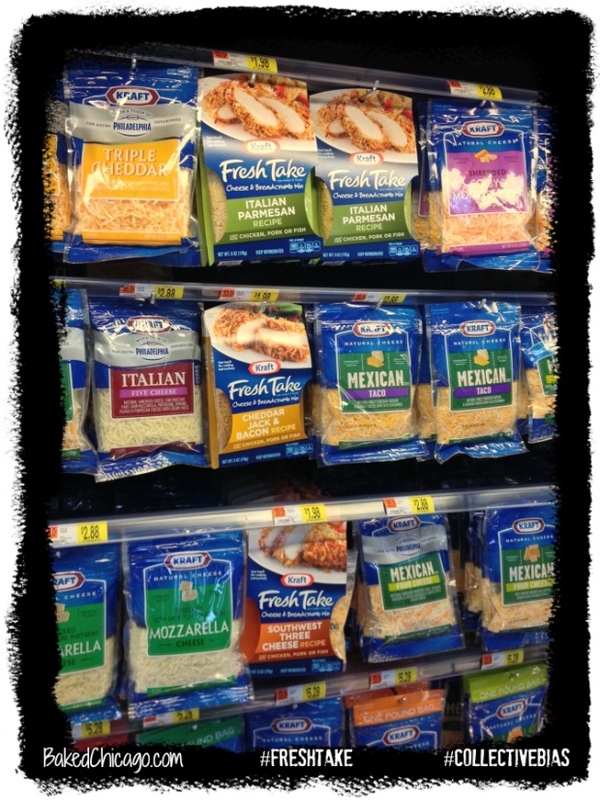 You’ll find KRAFT Fresh Take in the refrigerated cheese aisle. 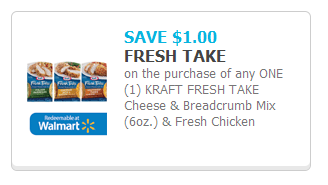 For a limited time, you can save $1.00 on the purchase of any KRAFT Fresh Take Cheese & Breadcrumb Mix and fresh chicken at Walmart. Get your $1.00 coupon here. 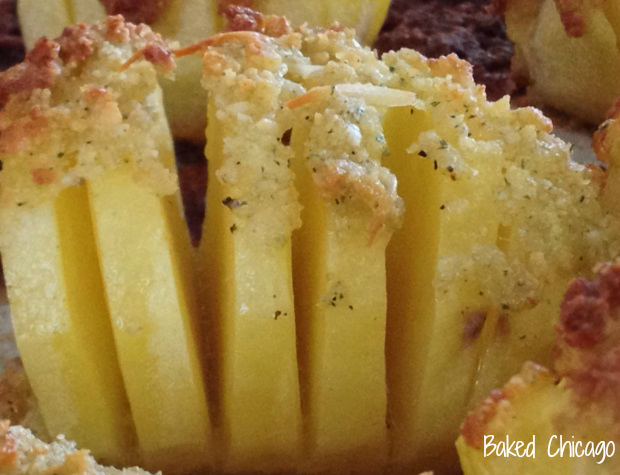 If you’ve read Baked Chicago before, you may know that I’ve never met a potato I didn’t like. And while I love a good baked potato, it can be kinda boring to serve for a special occasion. But not Hasselback Potatoes, which are Sweden’s version of baked potatoes. They were made popular by the restaurant inside the Hasselbacken Hotel in Stockholm that created the dish. This dish would also be something that you could cook to impress someone, like a first date, because they look like they would be difficult to make. But they’re not. It’s all in the presentation, and (from where I sit) there’s no need to let them know just how easy it was! During the cooking process, the potato start to fan out – making for a beautiful presentation on the plate. Preheat your oven to 400 F degrees. Line a rimmed baking sheet with parchment paper. Set aside. Place peeled potatoes on a cutting board. Cut a narrow slice from the bottom of each potato to help the potato lie flat; discard the slice. Place one wooden chopstick (2 total) on each side of the potato, lengthwise. 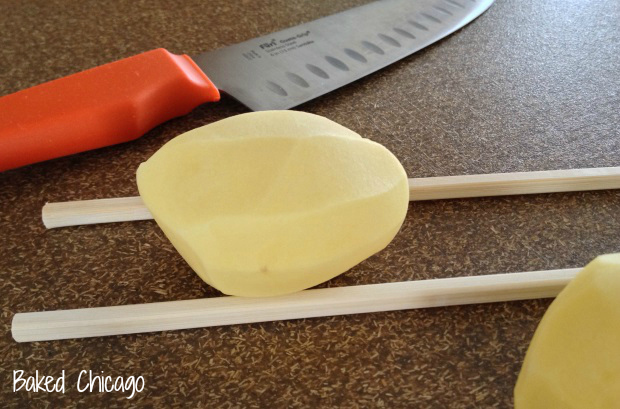 Use a knife to slice each potato crosswise making slices about 1/4-inch apart for the length of the potato. The chopsticks will prevent the knife from cutting through the bottom of the potato. You want to leave about 1/4-inch on the bottom of the potato intact. After cutting the potatoes, gently rinse them to rid excess starch which can impede fanning. Carefully flex the potatoes while rinsing under cold running water. Dry the potatoes well before baking. 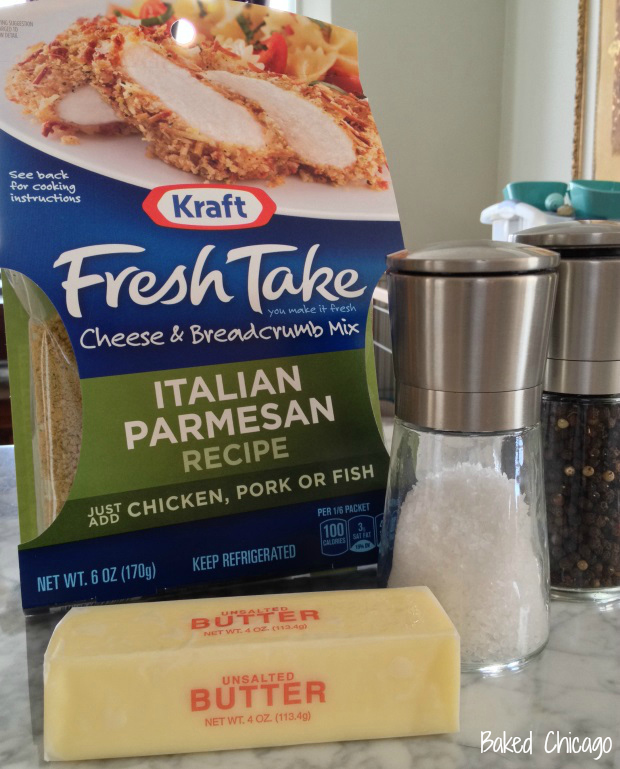 Place the contents of the entire KRAFT Fresh Take Italian Parmesan package in a food processor, along with olive oil. Pulse until well blended. Brush the potatoes with melted butter. Season lightly with salt and pepper. 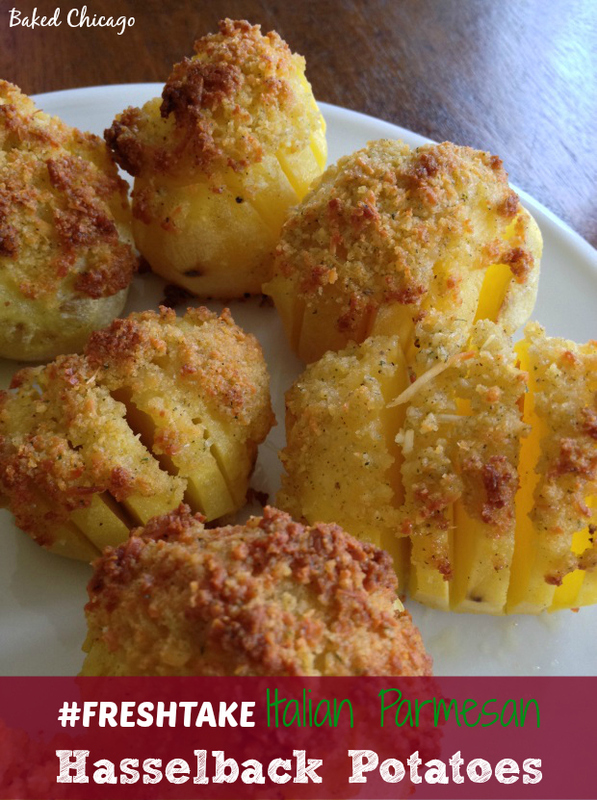 Pat the prepared KRAFT Fresh Take cheese & breadcrumb mixture on top of each potato. Place potatoes onto the prepared baking sheet. Cover with aluminum foil and bake for 20 to 25 minutes. Remove the aluminum foil and bake for an additional 5 to 10 minutes, or until they turn crispy and are fork-tender. Hasselback potatoes are also known as the Swedish version of baked potatoes, popularized by the restaurant at the Hasselbacken Hotel in Stockholm, Sweden. As the potatoes bake, the slices fan out slightly – making for an elegant presentation. The next dish I made was a slow cooker version of stuffed peppers. Many cooks use green bell peppers, but I personally think the vibrant colors of the orange, yellow and red bell peppers are much more visually appealing. As a kid, I hated most green vegetables. While my palate grew up, my eyes still find the same green of most vegetables to be quite dull. Go veggie! You can also turn this into a vegetarian dish by simply eliminating the ground turkey. What I love best about this recipe is that it’s another slow cooker home run. I have [undiagnosed] adult ADD. So anytime I can put something into the slow cooker and forget it for a few hours, I am so HOPPY…I mean HAPPY! In a skillet, cook the ground turkey until browned. Crumble it as you stir. Set aside. Cook the brown rice according to package directions. Set aside. Cut off the tops of each pepper, then core and remove seeds, membranes. Rinse out with cold water. If needed, slice off any uneven portion of the bottoms of each pepper in order for them to lie flat. Set aside. 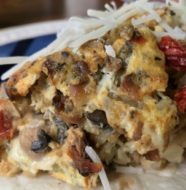 In a large bowl, combine the ground turkey, corn, black beans, diced tomatoes, salsa, onions, brown rice and Worcestershire sauce until blended. 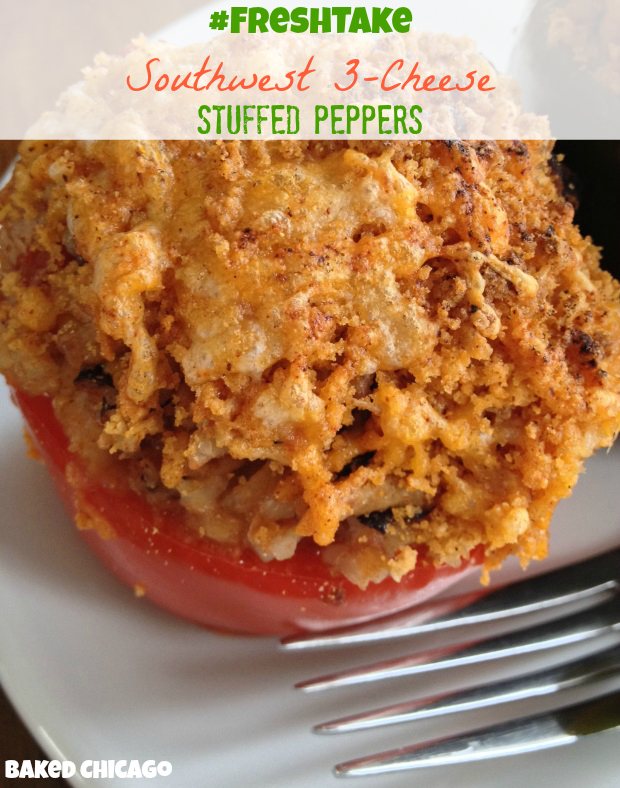 Stuff peppers with mixture and top with KRAFT Fresh Take cheese & breadcrumbs. Stand peppers in a slow cooker. Add 1/2 cup water in the bottom and cover. Cook on low for 6 hours (or on HIGH for 3 hours), or until peppers are tender. Makes 6 servings. 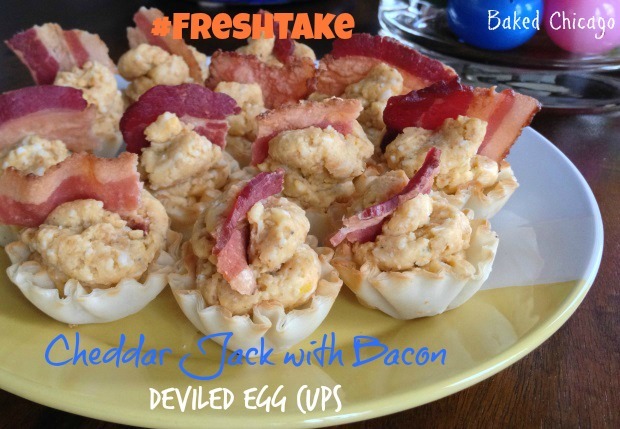 The final recipe for my Easter brunch is a twist on deviled eggs. I have always liked the taste of deviled eggs, but I’m not a fan of the rubbery texture that hard-boiled egg whites can sometimes have. Deviled egg cups use phyllo dough for the vessel, so it adds a nice crunchy texture that I find irresistible. And the filling couldn’t be easier. You essentially puree the hard-boiled eggs (yolks and whites!) and mix in the rest of the ingredients. Then pipe the filling into the phyllo shells and you’ve got a somewhat fancy appetizer that is great for a large gathering. But don’t forget to garnish with thick-cut bacon. That’s Bing and Baxter’s tip, because they love anything topped with bacon. And I concur. Preheat your oven to 350 F degrees. Line a baking sheet with parchment paper. Place the phyllo shells on baking sheet and bake for 5 minutes. Let cool. 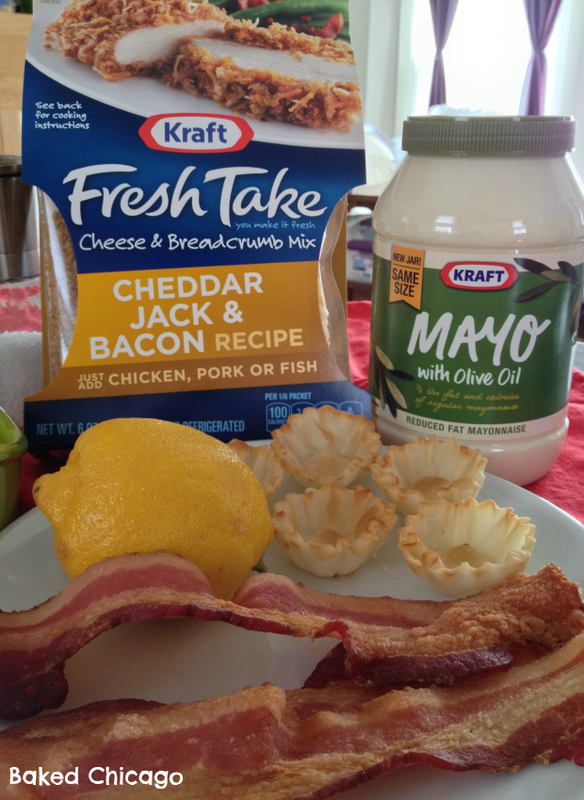 In food processor, puree eggs, mayonnaise, lemon juice, pepper, salt and contents of Fresh Take Cheddar Jack with Bacon. Put egg mixture in a resealable plastic bag, cut off tip and pipe into shells. 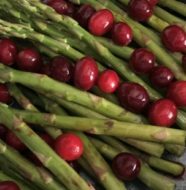 Garnish with chopped bacon and serve at room temperature. Makes 30 deviled egg cups. 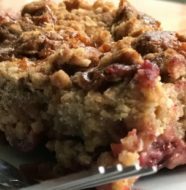 I hope you found some inspiration in these recipes as you prepare your Easter menu. Whether you’re cooking for yourself or for a super-humongous group, make it easy on the chef! Simple can also be delicious and a crowd-pleaser. What’s going to be on your Easter menu this year? Share your comments below. 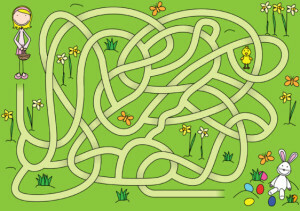 Many of my nieces and nephews have iPads and hand-held electronic games, so anything as “manual” as an Easter egg hunt may see alien to them as they get into their teens. 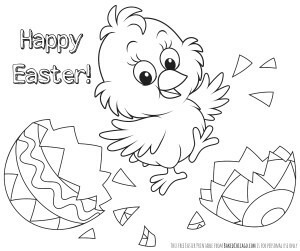 I remember as a younger kid that I loved to color with crayons and do word games/puzzles, so I wanted to share with you an Easter coloring page and maze puzzle (both are downloadable PDFs) that you can share. Who knows? It might just buy you 10 minutes of uninterrupted time in the kitchen. And for that, you’ll thank me!